DataXchange Real Time Machine Viewer - SFA Inc. Collecting shop floor data is one thing – making it useful is another. There is clearly value to having historical data, but having it presented in a meaningful format as the activities are happening greatly increases the value of any machine data collection system. Scytec DataXchange provides a user-configurable, real-time manufacturing dashboard providing feedback as the data is collected in a user-configurable interface. 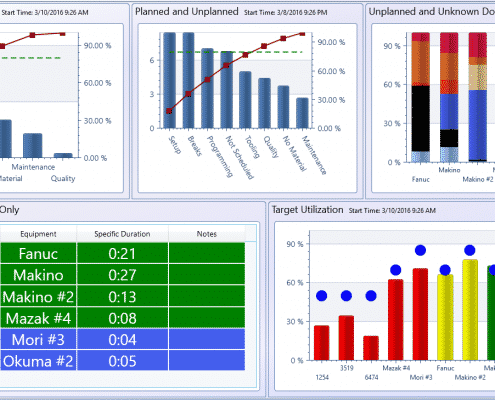 Scytec understands that those in lean manufacturing need up-to-the-minute shop floor data. 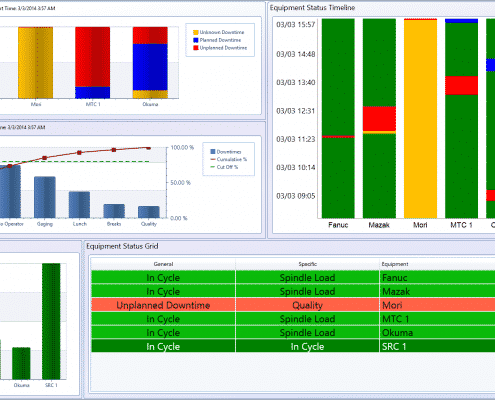 They have equipped their software with customizable manufacturing dashboards to provide feedback in real time as utilization, downtime and OEE data is collected. An unlimited amount of screens can be defined. Each screen shows the appropriate data for the area where the dashboard is being displayed. Show one chart, or multiple, such as the screenshot above. 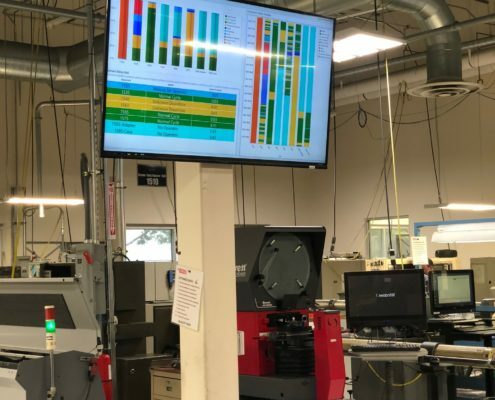 The views on the screen can show the current status of the equipment, part counts, target utilization, OEE metrics, downtime Paretos, downtime summaries, timeline views, shop floor layouts, Caron TMAC status, and much more. In addition, each of the views can be configured. Show the data a variety of different ways providing the metrics how you want to see it. Visual information helps articulate potential issues more clearly. The Scytec DataXchange Real-Time Viewer delivers visual data to stakeholders throughout the organization. This is done through user interfaces uniquely configured to suit the needs of specific users or functional areas. Visually, manufacturing data becomes accessible to more people. This enables faster decisions, along with the ability to accelerate respective workflows. This leads to faster, improved understanding and communication of information. With DataXchange, you don’t have to be on the shop floor to view manufacturing data. The manufacturing dashboards are available on iOS and Android mobile devices. Remotely view machine data in real time from home or on the road. The Real Time Viewer has a built-in Web Browser View. This feature allows for an internal or external web page to be displayed within the DataXchange dashboards. Display company messages, data from an internal company website, ERP information, or MS Office documents through Office Online. 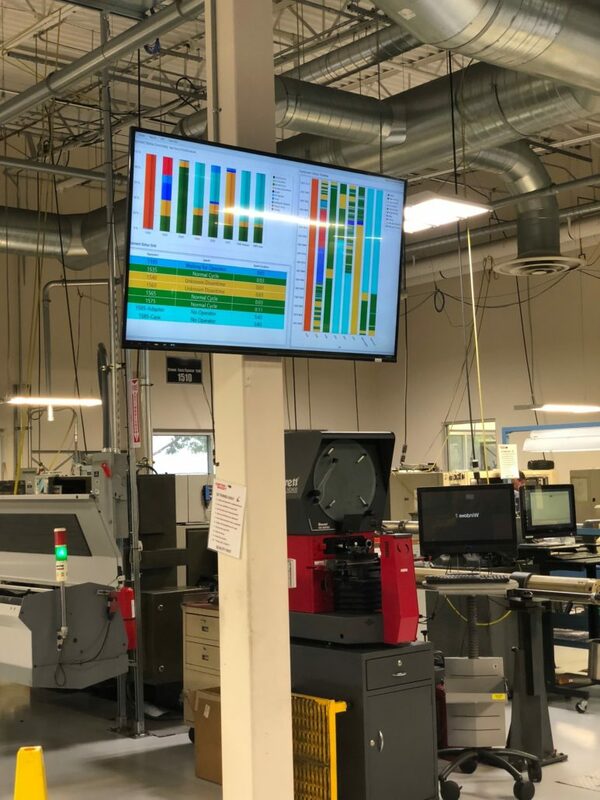 TV shop floor monitors can be set up by each machining cell with the real-time viewer configured to show the appropriate equipment for each cell. The PCs are configured to log in automatically while Scytec DataXchange will automatically launch, login, open the Real-Time Viewer, and launch the appropriate screen for display in the cell. 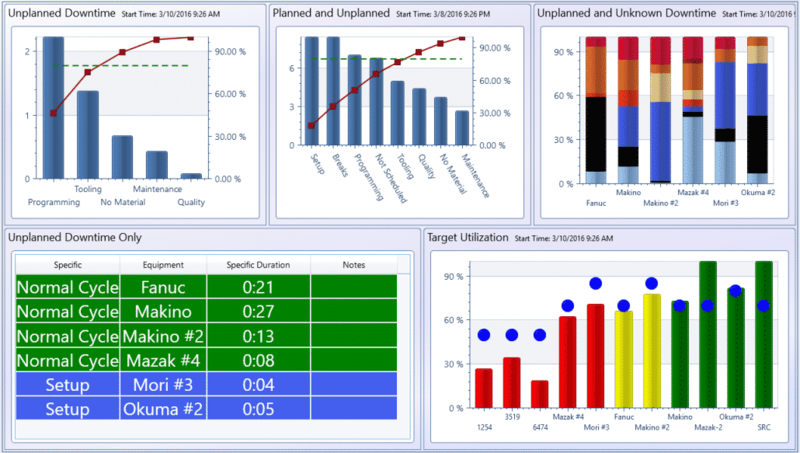 Visual dashboards can be configured by each user, or for use by functional areas, such as machining cells. 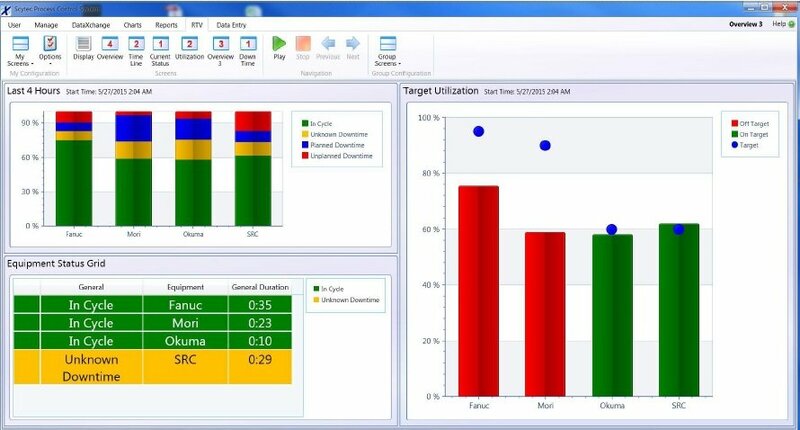 Personal dashboards allow users to customize part of the interface to suit their individual needs. 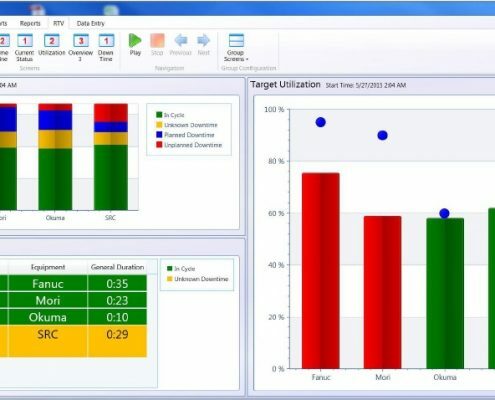 Multiple personal dashboards can be created providing quick access to a variety of different information. For example, you can configure a dashboard for machine operators that displays specific machine data summaries. The amount of time in a normal cycle status, in a downtime or low feed rate overrides. 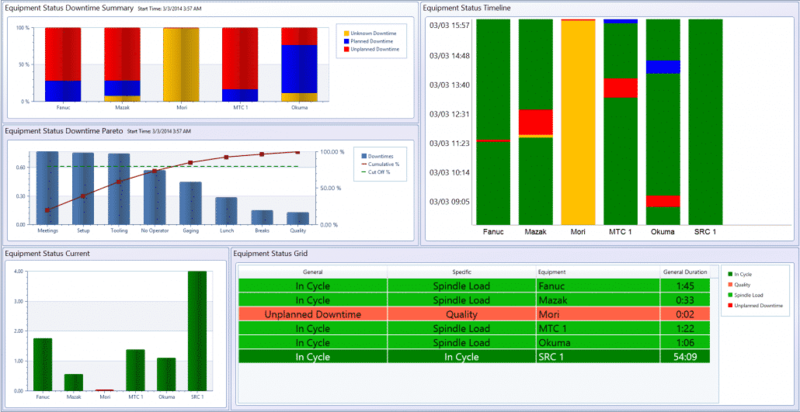 They can then configure a different view displaying an OEE dashboard for shop floor managers. This will display data on an entire functional area such as a manufacturing cell. Group dashboards also help achieve this goal. The Real-Time Viewer has customizable rotation functionality, allowing the configuration of rotating through multiple screens automatically. The rotation functionality of the manufacturing dashboard allows one TV to view an unlimited amount of information. For example, one screen displays overall summaries while other screens show the detail of specific machining centers. The rotation can also include Excel documents, show floor layout views, OEE, as well as maintenance-related information.